I’m Popeye the Sailor Man. I’m Popeye the Sailor Man. I’m strong to the finich, cause I eats me spinach. Well, not only for Popeye but Spinach is an excellent source of vitamins, magnesium, dietary fiber, potassium, calcium and other nutrients for all of us too. Fantastic to boost our strength. Chop spinach and keep half cup aside. Grind the rest with 2-3 tablespoons of water and keep aside. Heat oil in a pan (kadhai). Add chopped garlic and sauté for a minute. Remove half of the fried garlic and keep aside. Add dried chillies, cumin seeds, mustard seeds, asafoetida (hing) and chopped ginger in the pan and sauté for a minute. Now add chopped onions and sauté till browned and soft. Add turmeric powder, red chilli powder and salt and mix well. Add the half cup chopped spinach which was kept aside. Cook for 3-4 minutes. Add the 3/4th of the ground spinach in the pan and bring to boil (cook for 3-4 minutes). Turn off the flame and add the remaining spinach paste and mix well (this step keeps the colour of your dish to a nice green). 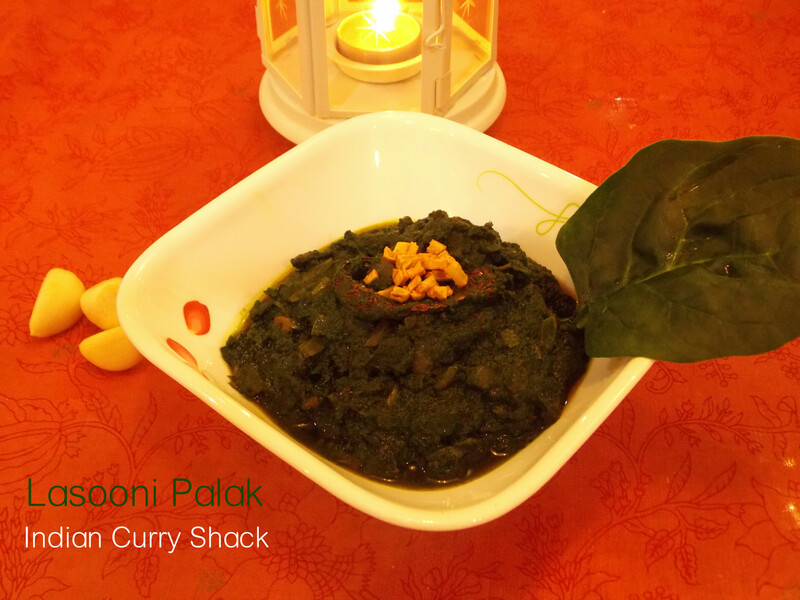 Your delicious and healthy Lasooni Palak (Spinach with a prominent garlic flavour) is ready. Garnish with the fried garlic (which was kept aside) and serve hot with chapati or plain paratha (Indian breads) or steamed rice. You did Popeye proud, this spinach dish is delicious, thank you so much. Save me some PLEASE!!! Fabulous!!! Can never have too much garlic! !